Free Wi-Fi signature breakfast and parking plus an indoor pool hot tub and a location close to area attractions welcome our guests at the pet-friendly La Quinta Inn & Suites Dublin rated one of the top hotels in the area. All 69 rooms at this three-story property offer cable TVs coffeemakers mini-fridges desks and complimentary Wi-Fi. In the morning guests start the day with the signature Bright Side Breakfast served on the house complete with make-your-own waffles hot and cold cereals breads fruit coffee and juice. The hotel has a business center meeting space fitness facility indoor swimming pool and hot tub for further convenience. The front desk is open 24 hours a day and can assist with early check-in valet laundry and dry cleaning. Parking is free of charge. 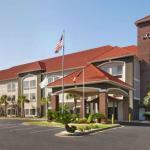 La Quinta Inn & Suites is located south of I-16. It is adjacent to Dublin-Laurens Welcome Center and about a half-mile from Heart of Georgia Technical College. Downtown Dublin is four miles away. Carl Vinson VA Medical Center Middle Georgia College and Dublin Mall are within seven miles. W.H. Bud Barron Airport is seven miles from the hotel while Middle Georgia Regional Airport is 57 miles. Dogs of all sizes are allowed for no additional fee; there is a pet policy to sign at check-in. Dogs must be able to be crated if left alone in the room.